Danielle designed today's set, Hello Spring, as a follow up to Hello Winter. The sentiment was an obvious complement to the images from Cottontail Cuties. I stamped and colored the images, and set them against a sunny yellow gingham sky. I added grassy hills and framed out the images with the sentiment. If you're still looking at snow outside, I hope this card puts a SPRING in your step today! Check out the NT blog this morning for more inspiration using this set - click! And before you go, don't forget to leave a comment - at the end of the week, a winner is chosen from among the blog comments. There is a 25$ store gift card up for grabs! Very cute card. Easter just around the corner. Thanks for sharing. Very cute. Love this stamp set and the sentiment too. What a cute little scene. I like the colors and patterns you put together. So cute. Your Cottontail Cuties are perfect! That little bunny girl is too darling. Love all the Spring colors. This card couldn't be any cuter! 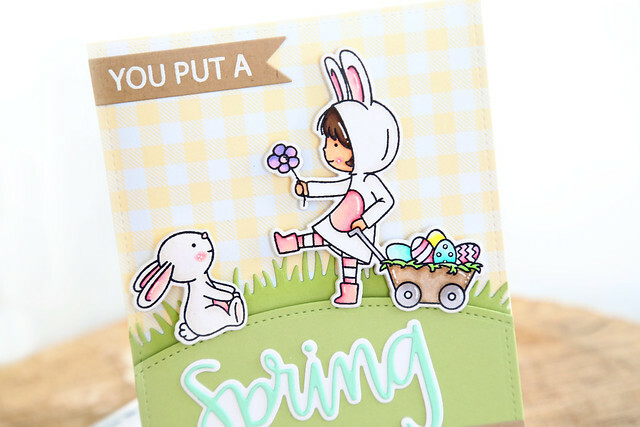 That adorable bunny and all the pretty spring colors you used makes for a very happy card! Adorable scene. I like the gingham background. I have dark, dreary, wet outside my window. Not sure I wouldn't rather have the snow. we wait for spring to get here. Your card is so adorable ! Awww, very precious scene you've created here. Love the sweet bunny receiving a pretty flower. Seriously just the cutest! That girl is perfect for the sentiment! ADORABLE! Love the little girl giving the bunny a flower!!! So sweet! Adorable card! Love your composition and coloring! Thanks for sharing your creativity! I just got this stamp and die set out to start making cards for spring and Easter! I love it so much and it looks fabulous with the new Spring set. I'm going to have to use your idea of combining these two sets together! This is such a cute scene, love your colouring. This is soooo adorable!! Love the little scene you created and that sentiment IS just perfect! 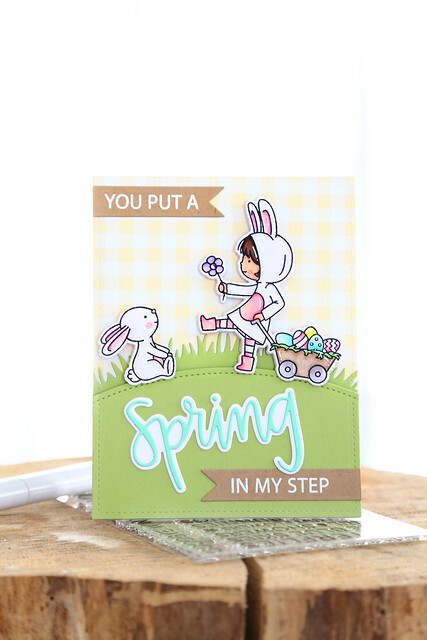 Oh, I love how you combined the Spring die with the Cottontail Cuties. They are so cute! Such an adorable card. Thanks for sharing. That is such a cute scene!